Where a VFX artist discusses science fiction and his journey through writing it. Gentry Race Davidson is a VFX artist from Portland, Oregon. He writes science fiction – post-cyberpunk, which, in his own words, is Gattaca meets X-men meets Ghost in the Shell/Akira – a mashup that makes any self-respecting cyberpunk fan drool a little. But back to Gentry. Gentry, as it turns out, is a massive movie and anime fan (if that wasn’t already obvious) and worked at DreamWorks, Evil Eye, and at LAIKA, the studio that produced the beautiful Kubo and the Two Strings. Like many of the authors I connect with, I met him through the 20Booksto50K group: I was scrolling down and down, and up pops a beautiful cover depicting what was unmistakably a ringworld. Ringworlds are awesome (Larry Niven and Halo are testaments to the fact), but pretty rare in indie scifi. I have no idea why. Needless to say, I reached out to Gentry. 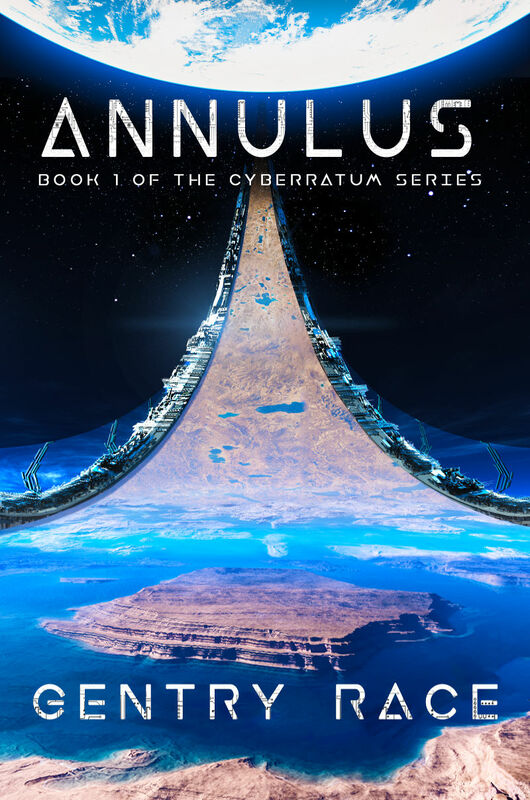 He had a first book out already – Artifex – and it turned out Annulus, the title with the Ringworld on the cover, was going to be next in the series. Color me intrigued: after a brief chat, I asked Gentry if I could record, across email, some of his answers to my questions. You work at LAIKA, which is famous for Kubo and the Two Strings, and you directly worked on Kubo for two years. What’s was it like? How do these movies really get made on the inside? I‘ve been working in visual effects for 5+ years now and LAIKA has been a big part of that. To be able to do my 9-5 in a creative environment such as LAIKA I am truly honored. The movie industry generally has three phases. Preproduction, Production, and Post production. Preproduction involves conceiving the idea, script, concept art, and design. LAIKA has to hand make everything! Then there’s Production, where the facial expressions of each character is 3D printed. The puppets are then animated and shot on stages one frame at a time. Different “passes” or “takes” are filmed concurrently to help with VFX integration/look development of each shot. This is where it falls into Post production and any seams on the character’s face have to be “mended”. In addition, rigs that have helped the animators animated need to be removed and replaced with the background or “Clean Plate”, respectively. I’m sure this all sounds confusing and this link can provide a better visual of what the VFX Dept. at LAIKAcan do. One thing that is great is to be able to scroll through the different Acts and see the sequences that drive the plot. LAIKA has a solid grasp on theme and character. I remember working on Kubo and realizing the subtle themes it played with such as memory, story and death. In return, this has shown me how to handle themes in my own stories and how approach them. I wrote a screenplay at first. It was terrible. I did this while working at LAIKA, submitted it and of course they passed. It seemed indie authoring was the way to go. So I wrote the first draft and my editor said expand the first act cause the plot was too crowded. So, here we are . . . . It did! So much better. And there is a lot to the world so it’s a bit slower introducing new concepts, and so on. I think it was for the best best. Think Gattaca meets X-men meets Ghost in the Shell/Akira. So on the subject of the new novel that you’re working on, and the series that it fits into – this involves a huge ringworld orbiting the Earth – and it’s not just a ringworld, but a particle accelerator? Well, the kinds of matter you can produce in a particle accelerator are contingent on the accelerator’s size. Right now, CERN’s Large Hadron Collider is the largest collider known to man. What I wanted was a future where new exotic matter, produced by even larger accelerators, allows for hyper-printing of materials – including our flesh, allowing a sort of Post-Cyberpunk future to emerge. Hence Annulus, a particle accelerator encircling the earth. The technological singularity has begun and mankind is giving up flesh/cyborg-modded parts for the perfect hyper-printed bodies. The story revolves around errors in the printing called erratum*. These Eradicates, as I call them, are hunted by PSYOP teams. Artifex [the first book] was written as a reader magnet and establishes some crucial characters for Book One, along with introducing the antithesis that will help and hurt the main character. The theme is what it’s like to have an imperfection in a perfect society – and what it’s like to cope without the crutch of technology in such a very advanced world. This is where I ask you about your top ten favourite books, and of course, why you admire these authors. Sphere, Jurassic Park, The Diamond Age, Travels, Watchmen, Congo, Ghost in the Shell, Arrival, Eaters of the Dead, and Minority Report (Original Short). Making that list above allowed me to really think about what I liked about the stories. Most of Michael Crichton’s books are also filled with science tidbits you take with you long after reading. I love this, along with the unexpectedness of flipping the genre and telling a unique story. In Sphere, for example, I loved how it starts off as an alien investigation and turns it onto its head. *Yudhanjaya’s note: my mind immediately jumped to Michael Crichton’s transcription errors from Timeline. Some of that stuff was genuinely horrifying, especially the cat with the split face – and, of course, Robert Decker himself. Want to see more interviews like this in your inbox?